this little dog | when he looks at me | what does he see? We have this gorgeous, highly intelligent and hyper-active Jack Russell x Fox Terrier who doesn't know he's a dog. He's so totally part of the family, eats what we eat, goes where we go, and if he can't go, we don't go. He's got a certain air about him, and people everywhere respond and just love to stop and talk to him and he returns the favour - he loves people, is absolutely mad about children, loves cats and hates rats and has a huge basket full of toys. When we're at the shopping mall, we have to visit the C.N.A. (Central News Agency, large stationery and bookstore that also stocks toys) so he can see the latest additions, and he'll show me which soft toy he wants by snuffling through the lot and choosing one. And he knows each one by name. Thanks Lisa. Just LOVE your calligraphy! Used to do a lot of calligraphy, but haven't done so for years - maybe it's like riding a bicycle? 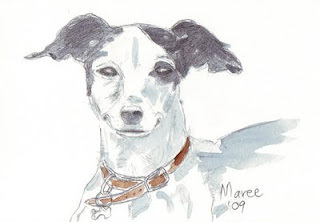 And your sketch of your friend and her dog is absolutely wonderful. Jacko is surely the life of the party--when there isn't a party, he'll create one, I can tell. Thank you for sharing him with us, Maree. It makes me happy to meet you, Jacko.